Home › Blog Topics › Social Media in the LMC–What’s All the Hype? Social Media in the LMC–What’s All the Hype? 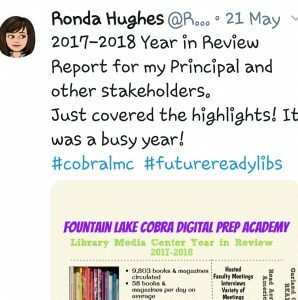 Social media is an easy platform from which you can shout the great things that are happening inside of your school library. I am shocked at how often I cross paths with people that still think a library is a place of “shushing.” Today’s school library is a library media center, a place where students can collaborate, create, experiment, problem solve, and yes, read some great books. Since we are surrounded by “old school” thinkers who believe the library is quickly becoming a thing of the past, being replaced by the Internet and the ability to “Google,” we must demonstrate that the LMC is actually the hub of learning within our schools. It is difficult to boast about one’s artful lessons of learning without feeling awkward, but that is where social media comes in. Most parents, administrators, community stakeholders, and even legislators are using Facebook and Twitter. What better way to announce the great activities that are going on inside of our doors, complete with photos of students engaged, than social media? Twitter has taken my social media skills to new heights. 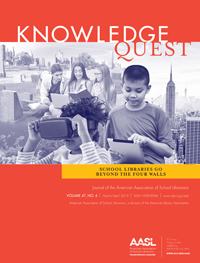 Many authors, publishers, and other educators are tweeting and following others in the field. My students have connected with authors of their favorite books and book club selections via tweets, which always builds excitement and ultimately desire to read new books. I have found that authors will respond on Twitter, in ways that just won’t happen with snail mail or email. Many authors will gladly Skype for FREE with students when approached through a tweet. Some of my Twitter posts about activities in my LMC have gotten the attention of my state department of education and lieutenant governor. Twitter chats are great ways to have “conversations” with other educators. 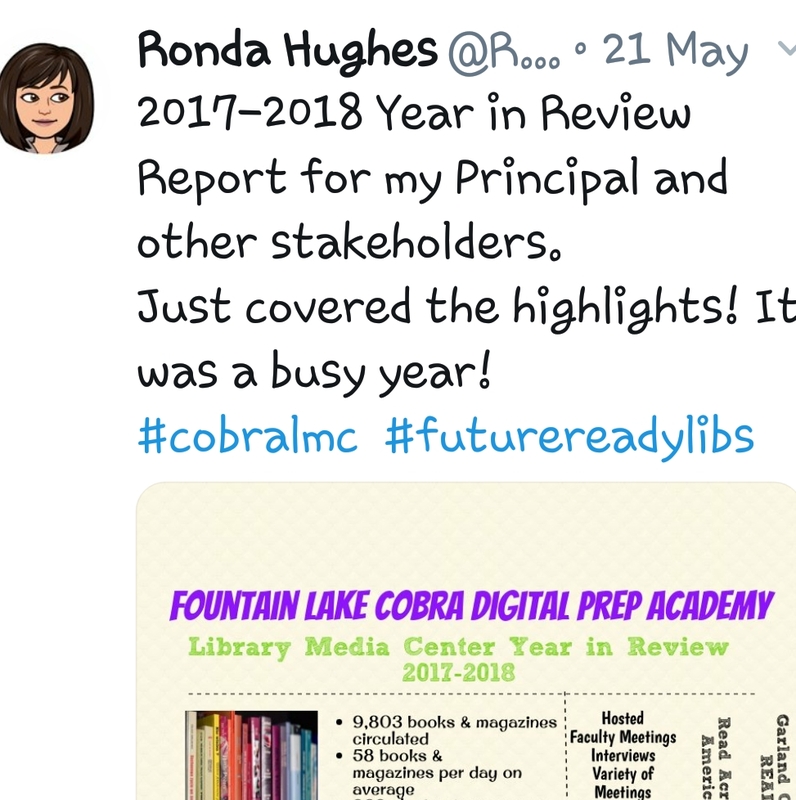 Just this month I participated in a #futurereadylibs chat with school librarians from around the country. In one hour we shared summer reading selections, great lessons, and even some epic fails. The commentator posed five questions to which we each responded and commented and learned. After the chat I carefully reread posts and replies and made notes of ideas to try and book titles that I need to read. I even had an author reach out to me after the chat, thanking me for my recommendation of her new book. I use Twitter strictly professionally to advocate, promote, and connect. I use my personal Facebook account to ‘Like” professional pages; Connected Book Club, Future Ready Librarians, School Librarians/Library Technicians, Middle School Librarians, etc. I can connect with professional peers across the country to collaborate on lessons, virtual book clubs, ask questions, as well as “bounce ideas.” I can follow the posts on these professional pages; when a topic interests me, I simply turn on my notifications for that post and read the comments as time allows. 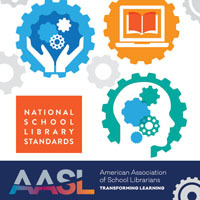 I have followed posts about circulation system questions, ideas about themes, and most recently the new ISTE and Future Ready Librarian Crosswalks. Facebook is a great resource to connect with others in our field. Social media is such a great tool to advocate for your library–use it! 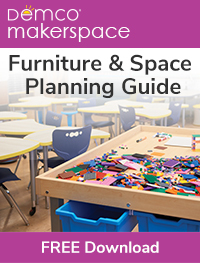 Ronda Hughes is a Middle School Library Media Specialist in Hot Springs, Arkansas. She has 19 years experience in public education as: a Physical Education teacher, 5th grade Literacy teacher and a library media specialist. Hughes has served as Tri-Lakes Reading Council President, Arkansas Reading Association Intellectual Chair, Alpha Delta Kappa Vice President, and Arkansas Association of Instructional Media Board Member. 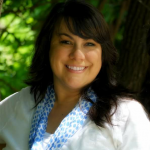 She has been on numerous committees such as; Arkansas Department of Education K-8 Computer Science Standards and Library Media Standards, Garland County READS, Arkansas Diamond Book Award Committee, Charlie May Simon Book Award Committee, just to name a few.